Get the most out of your convertible top cleaner with this brush! Now you can get the benefits of horse hair on your convertible top with the RaggTopp Natural Horse Hair Convertible Top Brush. There is simply no better way to clean fabric or vinyl convertible tops. The densely packed horse hairs massage the convertible top to release soil and grime, without scratching vinyl or loosening fibers. The RaggTopp Natural Horse Hair Convertible Top Brush has an ergonomic design that is comfortable to use. The short bristles are grouped into thick bundles and permanently adhered to a molded plastic block. The angle of the block allows you to hold the brush in a position that is most natural when scrubbing. The shape of the brush reduces hand fatigue and gets the job done faster. Use the RaggTopp Natural Horse Hair Convertible Top Brush to work RaggTopp Fabric/Vinyl Cleaner into the convertible top. Then follow with the appropriate RaggTopp protectant for your convertible top's material. 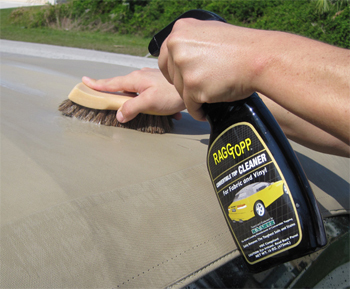 The RaggTopp Natural Horse Hair Convertible Top Brush also works well on tonneau covers and bimini tops. Trust your vehicle’s convertible top to the finest detailing brush nature has to offer! The RaggTopp Natural Horse Hair Convertible Top Brush gently cleans fabric and vinyl convertible tops.